Active adults and retirees have been flocking to the Redding, California area for years due to its desirable location. Close to the Pacific Ocean yet conveniently located next to the Cascade mountain range, age-restricted communities in the Redding area have nearly endless recreational opportunities at their fingertips. With the excitement of urban living and a lower cost of living than other Northern California active adult communities, residents of Redding enjoy all the cultural attractions of the area at a fraction of the cost. Age-restricted communities in Redding, California are located in Shasta County. 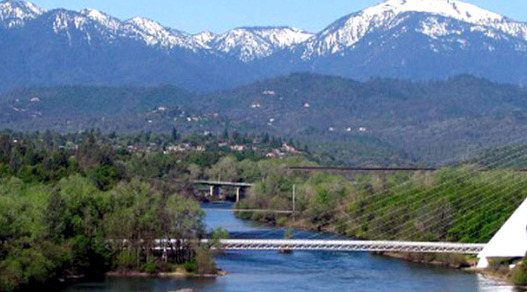 Redding is considered as the area inhabiting the northwestern end of the Central Valley. Redding is located in an outdoor lovers paradise with mountains to the north, east, and west and farm land to the south. Elevation changes in Redding vary from about 500 to 800 feet depending on the specific location within the city limits. 55+ communities in the Redding, California area experience a typical Mediterranean climate with hot, dry summers and mild, wet winters. Average summer highs are in the upper 90s with lows in the upper 70s. The winter brings highs in the lower 60s and lows in the mid 30s. Winters can see rain, fog and occasional snow. With less than five inches of snow and 321 days of sunshine annually, residents of 55+ communities in Redding make the most of outdoor living. Given the variety of natural landscapes that surround active adult communities in the Redding, California area, residents prize outdoor recreation. Mountain biking is especially popular and Redding is famous for organizing the first mountain bike race in the world. Popular local trails include the Sacramento Rail Trail, Middle Creek Trail and the Arboretum Loop that features wetlands with birds and turtles found throughout its 200 acres of open space. Age-targeted neighborhoods in Redding, CA have Shasta-Trinity National Forest, Six Rivers National Forest and Lassen National Forest just outside of the city limits. Choosing an age-restricted neighborhood in the Redding, California area also means having access to the conveniences and excitement of urban living. The Old City Hall Arts Center, Redding Civic Auditorium and the Cascade Theater host the area s cultural events. The Shasta State Historic Park is sure to please history buffs with its replica of an Old West town complete with museum. 55+ communities in the Redding, California area are also conveniently located next to the Mt. Shasta Mall and feature local restaurants and shopping in its downtown area. For quick day trips, Napa Valley and San Francisco are a short drive away. Age-targeted communities in the Redding, California area have a slightly higher cost of living than the rest of the country. On average, residents of the Redding, California area spend much more on housing, transportation and utilities than their counterparts throughout the country for a cost of living that is 21 percent higher than the national average. Choosing an active adult community in Redding, CA, however, is less expensive than California in general and residents can expect to spend nine percent less on living expenses with most of those savings coming from home prices. 55+ communities in the Redding, California area have two hospitals at their disposal. The Mercy Medical Center Redding has four high-performing specialties while Shasta Regional Medical Center has three high-performing specialties. Both hospitals excel in nephrology, pulmonology and orthopedics. The University of California, Davis Medical Center, rated as one of the top hospitals in the state, is located in nearby Sacramento.